It's been five generations after the first war between Samurai and Shinobi. The five villages were founded shortly after and there has never been a war between them. Until now, all five villages have been off limits to the outside world, however the gates have been opened and ninja were allowed to travel between. But suddenly, kage are falling ill and no one knows who's behind it. The Hokage and Raikage both lie in comatose state, awaiting an answer as to what put them there. Appearance: A grown man in his own right, Hiro's appearance proves this. Standing at a rough six feet three inches, Hiro's frame is filled out nicely with one hundred eighty-five pounds of lean muscle packed over dense bone. Rough calloused hands show that he earned his strength and muscle from hard-work. Framing his angular face is a mop medium length brown hair that is in a generally messy look despite his younger sister's constant protests and attempts to straighten it. Usually partially covered by his dark brown hair are a pair of baby blue eyes that sparkle with something more than childhood glee. Something more angry. The rest of Hiro's body is one that tells a story. Scars dot the man's body as if he had already gone to hell and back before his twentieth birthday. Across his back are a series of seven deep, and grotesque, scars from where he stopped kunai from killing his sister. Across his chest is a long, deep scar that starts at his left collar bone and ends over his right right hip. Received while trying to retrieve his sister from the Tokisaki family's grasp. Several smaller, less noticeable scars cover the rest of his body from the attack into Tokisaki territory and the escape with his sister. Hiro normally wears light colored clothes to reflect more heat away from his body in the hot Suna sun, mostly revolving around white short sleeved shirts and white shinobi pants. On his feet he wears a pair of white shinobi sandals. The only thing dark colored are a pair of gloves that leave the middle and index fingers bare. The Leader: Hiro was raised from an early age to be the leader of his people. He has a hard time taking orders from people for this reason alone, believing he is most likely a better leader than them. Few people are raised to lead an entire village, however small, from birth. Even then, few were given permission to form their own opinions regarding subjects. Because of this, Hiro is a freethinking individual with little bias towards those that have no cause for it, save for those apart of the Tokisaki family. He considers that family to be his mortal enemy and will not settle until none are left on the face of the planet. The Protector: The second value he grew up with was the strength of the protector. Giving one's own life in service of a greater goal, the protection of someone else, or a group. And Hiro embraced this value. He threw himself into his training to better protect his family from the Tokisaki. After the destruction of both villages, Hiro threw himself even harder into his training, blaming himself for the destruction of his home and death of his family. Even still, he would gladly give his life for those they he feels deserve it, which is an increasingly short list. The Dutiful Brother: The final tenant he grew up learning, was to be always faithful to his younger sister. This was one thing that he gives his utmost devotion to. All other tenants will be abandoned before this one. He would never willingly let any harm come to his sister whether it be from others or himself. She is one of the few people he would willingly give his live for, having demonstrated this several times before. The Samurai: Even from an early age, Hiro felt that the best way to protect his family was the way of the sword. A noble and elegant weapon was the only way to go to insure his remaining family stay protected from the outside forces. 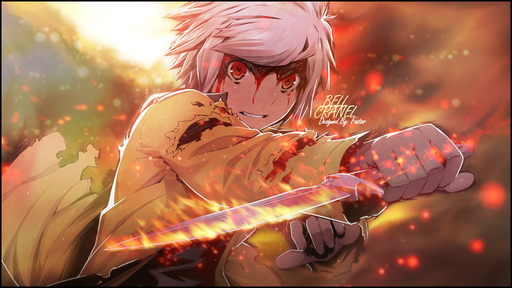 Combined with his element of Raiton, he hopes his swords skills will become unstoppable and the perfect defense. Nindo: Protect His Sister at all Costs. History: A long time ago, there were two families that lived side by side in peace. Literally, their tiny villages were built on hilltops next to each other. They were known as the Tokisaki and the Suzuki families. They were simple shinobi families that trained to protect their loved ones nothing more nothing less. So ne night when a woman from the Suzuki family was found dead in what was claimed to be Tokisaki family territory, it enraged the Suzuki family and they demanded someone from the other family die. So, to make piece a member from the Tokisaki family was killed. However, there were still members from each family that held grudges, which eventually caused a war between families. People from each side were killed or tortured. This happened while the daughter of the Tokisaki Family and the son of the Suzuki Family fell in love. Although they knew it would never work, they met in secret every night. Then one day, these lovers became the heads of their families. The girl had only become the families head due to the fact that she was an only child. This was wonderful news for the two but it was also heartbreaking. They knew they could never be together but they also knew that they could find a way to make peace between the families. After many attempts at a compromise, they had finally succeeded. It was stated that if anyone crosses into the opposite families territory, they could be killed on sight with no retaliation. For a long time, everything was at peace and the families lived happily in their own territories. The new family heads kept the peace treaty and prepared the next one to do the same. However, this treaty would one day be broken. It was about 20 years ago, the family head of the Suzuki Family and his wife were about to have their first child. At the time, the two were very young and in love. The mother was a beautiful woman with long blonde hair and pretty blue eyes. Her name was Arisu. The father was a strong brown haired man with dark green eyes. His name was Hisashi. They would have a son with brown hair and blue eyes. His name was Hiro. He was their pride and joy. They believed he would grow up to be strong, brave, a protector, and a great family head. They would raise him to be caring and respectful. They would love him more than anything they had. This boy wold be their number one or at least they thought. Five years later, this mother gave birth to a beautiful baby girl with blonde hair and green eyes. Her name was Akira. She would become their princess. She would become her brother's best friend. He would become her idol. They would be inseparable. He would hold her while she was little. He would play with her and make sure she wasn't lonely. Of course, he would have to take time to train but he would always make time for his little sister. Their mother and father would always have time for the two. They seemed like the perfect family, however things began to turn sour after Akira had turned four. It was said that the Tokisaki family had been increasingly coming across the territory lines, which had of course caused the Suzuki family to become worrisome. They believed the Tokisaki family was planning to do something but what? Perhaps, they were getting ready to attack the Suzuki family. However, Hisashi assure everyone that the treaty would keep them safe. They simply stick with the treaty and everyone would be alright. They wouldn't take any bait the Tokisaki family could throw at them. For a while, everything seemed still. Nothing felt normal. Nothing felt completely safe. People across the hilltop were training everyday. They were growing stronger just in case. It was this way for a whole year. After a year, everything simply exploded. The Tokisaki Family had found a few women and children dead on their own property yet blamed the Suzuki Family. The pressure blew up all around. Everyone was nervous. They were all on the edge of their seats waiting for the fighting to begin. The Suzuki were waiting for the Tokisaki to attack. However, they never did. Instead, they slipped in quickly and quietly. They abducted several of the smaller children, including Akira, in their sleep and took them to Tokisaki homes. Their plan was to torture the children and kill them. They were going to get revenge for their lost children. He had already grown into a young man when this happened. He was ten and his sister was missing, he wasn't just going to sit on his thumbs in safety while his sister was in danger. So he joined the invasion party. He was the smallest of the members but he lead the group from the front with his father. The incursion into enemy territory was met with great resistance which resulted in many casualties for both sides. Hiro received his own fair share of wounds but refused to retreat. He continued to press on, right next to his father. They would eventually find his sister being accosted by a man with a knife. Blood soaked them both as he dug around in her mouth with a knife. The crying of his sister sent him in a rage, but before he could act, His father proceeded to stab the man in the head, instantly killing him causing the man to collapse to the floor whilst twitching as his nerves finished receiving the final nodes of information. Hiro was quickly drawn back into the battle as he more Tokisaki soldiers arrived. Together, he and his father escorted the remaining children from the premises and back to their home. But by the time they got to the remainder of their army, Hiro's father took a mortal wound to his back and chose to remain behind to hold back the enemy with his mother and the remainder of the army. Despite being heavily wounded from several Kunai, Hiro was able to get out of the area safely before being found by the last members of the Suzuki household. He was officially their leader and would protect him until he was well. And they did. They rested at a hospital in a town for several years until his wounds had fully healed. The wound on his chest was the last to heal for unknown reasons, leaving an ugly and jagged scar crossing his chest. As they waited for his sister to recover enough to leave the hospital, Hiro began training again. This time with the remainder of his household, making sure they were ready for any remaining Tokisaki family members still around. Despite the fact he doubted any would wish further conflict, he had to be prepared. He swore a blood oath that he would end the Tokisaki family line no matter what on the day his sister was deemed fit and they were discharged. That led him to get in contact with Hatori. Hatori was an old contact of his father's who assisted him on many matters. As a favor to him, Hatori agreed to bring them to Sunagakure until he was ready to truly ascend to the head of the Suzuki household. After arriving in Sunagakure, Hatori spoke to the Kage on Hiro's behalf and after some negotiating, agreed to make Hiro a probationary Genin so that he could still train with a team as he attended lessons to insure he was up to par with the rest of the genin. Despite a few set backs with laws of Sunagakure and the like, Hiro was made a full genin and given a protector that he gladly took up, tying it to his forehead. Many missions, and three times as many training days, later Hiro found himself accepting the Chunin vest of his new rank and duties. A member of a small team of chunin, he quickly found himself rising in ranks. Many years spent serving Sunagakure were coming to fruition and he found himself with more responsibilities.